1,Approved for Automotive clip plier set,These tools enable you to immediately and very easily clear away car door panel and upholstery clips with out causing hurt to them. 2,Easily and safely to remove radio panel, trim, molding, door panels, and dashboards. 3,Reduce the concave and protruding scars left by using screw knife or other non-efficient tools. 4,High quality rugged design that made of durable plastic. 5,Work on interior and exterior trim, wide edge remover, handle remover or upholstery clip remover. Size may be 2cm/1 inch inaccuracy due to hand measure,Thanks for your understanding. Free Fastener Remover: Steel shaft and convenient handle for metal or plastic clips removal ;Great for automotive snap on trim panel and molding removal. 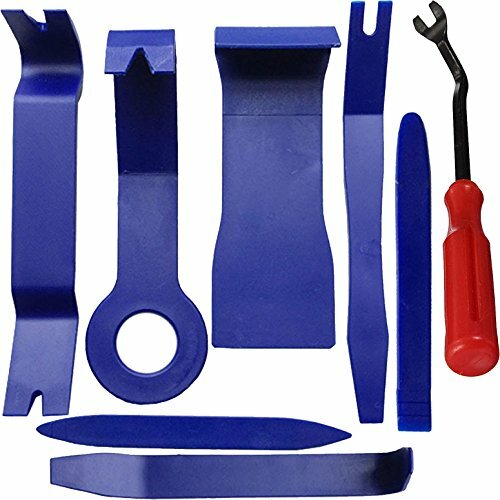 Package include: 7 x Plastic Panel Removal Tool, 1 x Steel Fastener Remover. ,It usually takes about 7-15 days to delivery your hand. If you have any questions about this product by TTAM, contact us by completing and submitting the form below. If you are looking for a specif part number, please include it with your message.